The best way I can describe it is that the screen is in a 1:1 aspect ratio. I went to the amd properties, and there is no Progressive mode for 1080p. I can run any other resolution, but I want 1080p. This used to work, even after the clean install to a new hard drive, then just one day, no matter what version of the driver I install, I can't get 1080p to look normal. 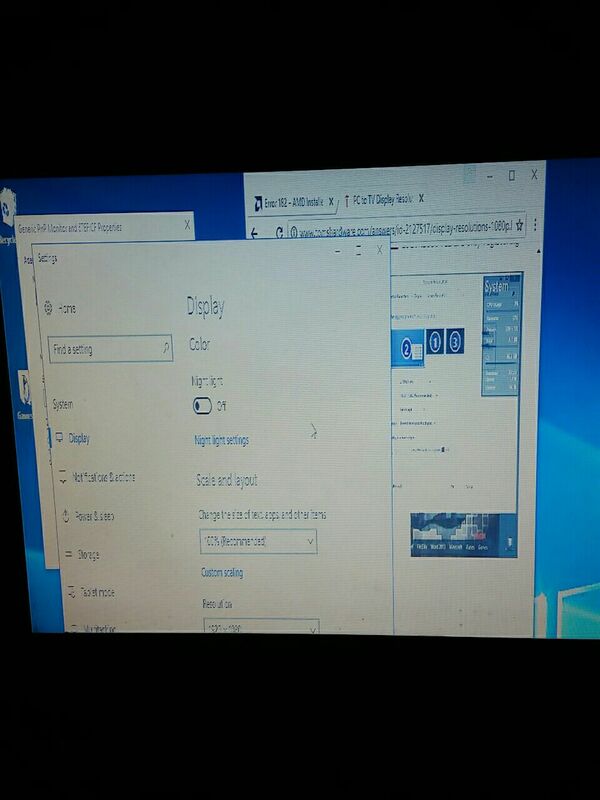 When you go to Windows Settings - Display, does the resolution range show 1920 x 1080 for your monitor? Plus are all monitors connected to your computer able to display 1920 x 1080 resolution? Yes, 1080 is available in the Windows Display settings. The picture is of me showing you the display setting for windows. I actually can't even change the setting to 1080p in the AMD software, because it now tells me that my display is not compatible, however, the TV I am using is the same one I have been using for 2 years, and it always has allowed 1080p with out this stretching problem the entire time. You image is little bit fuzzy to read. By the way, What does Device Manager show under Display and Monitor categories ? Check Windows Update and see if by any chance it updated your Display driver. Sounds like your Display driver, that is running, might be the MS Basic Display Adapter which is why I asked to check Device Manager to find out what driver is running and if your GPU and Monitor show up correctly. Just trying to eliminate the obvious. It is fuzzy, but that's what it looks like. It's terrible. I did think to check device manager, and check for display driver updates. The only update that my system needed was for my network card, which of course didn't fix anything. If you still have your old GPU card, reinstall it and see if you continue to have the same problem. I have the current driver. I even tried to uninstall it and go back to the driver I previously had but for some reason it always quits installing halfway through. I tried using my older graphics card, and I was able to get 1080p just fine. Its hard to know whether you Rx460 is bad or it's a bad driver. There is a program I use and is free to download and use called OCCT. It has a stress test for the GPU card plus it also checks the GPU for error when its running. It takes about an hour to complete the test. OCCT also tests the CPU and PSU. Try running OCCT GPU stress test with errors (checked box) on Full screen. It uses two DX's. DX9 or DX11. Your card should run with DX11 checked, if not try DX9. Run the test and see if the GPU has any errors after running the test. According to OCCT, When it checks the GPU for errors, it checks what goes to the GPU and what exits the GPU. Any difference would show up as an error and on on the main monitor only. Or you can always try some other program that will stress test your GPU card to see if it is good. At least it may indicate if you have a good or bad GPU card. Use DDU (latest edition) in safe mode to uninstall your current AMD drivers. reboot and Try installing the AMD drivers again. you might also run in administrative right Command Prompt using "SFC /scannow" to check your Windows 10 core files to make sure they are all good. Also be sure Windows 10 is fully updated thru Windows Update before reinstalling the drivers.